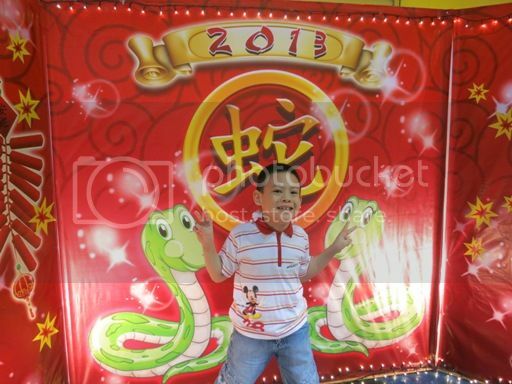 We saw this lovely Chinese New Year backdrop inside Tom’s World last Saturday, and the little boy was more than willing to pose for the camera simply because I’d be giving him money to buy tokens to play arcade ganes afterwards. Lol! Oh, by the way, Chinese New Year 2013 starts today. This year, 2013, is the Year of the Water Snake. Kung Hei Fat Choi, everyone! I read somewhere that wearing red on Chinese New Year brings good fortune, so I wore a red blouse when I went to church earlier today. I guess there’s really no harm in following this tradition. This entry was posted in 2013, Chinese New Year, Year of the Water Snake. Bookmark the permalink.